In English and American law an accessory is a person who, without committing a criminal act with his own hands, or without even being present, aiding and abetting the criminal, nevertheless shares in the guilt of the act, in one of two ways: either by counseling, advising, or procuring the act to be done, in which case he is called "an accessory before the fact," and is considered fully as guilty as the principal offender, or by shielding such offender from punishment, after the act is committed, when the person so shielding becomes an accessory after the fact, whose degree of guilt is lower than that of the principal. The Bible treats very fully of Accessories to one offense, that of idolatry. An individual who advises another to worship false gods is guilty of a substantive offense, and is known as =seducer (Deut. xiii. 7-12; see Abetment). Such seducer is to be put to death by stoning, because "he has sought to mislead thee" (Deut. xiii. 10, Heb. 11). It is, therefore, not necessary that any one should have been actually misled, as the very attempt at seduction is punishable with death. The verses Deut. xiii. 13-19 begin by assuming that a few worthless men may mislead the inhabitants of a city into idol-worship and command that the city be destroyed, but say nothing about any special punishment for the instigators. Hence, neither the first nor the second passage deals with the case of a true "accessory before the fact"; that is, with the one who is punished, because he has counseled the commission of a crime which has been committed by others. The Mishnah (Sanh. vii. 10) defines the offense of a private person (not a prophet) who seduces individuals (not a whole city) and sets forth the manner of procedure against him. In Deut. xiii. 8, Heb. 9, the person sought to be seduced is commanded: "Neither shall thine eye pity him, neither shalt thou spare, neither shalt thou conceal him." Here, then, is a law declaring that to shield this class of offenders from punishment is sinful. But one who thus becomes an accessory after the fact to the offense of shielding cannot be punished; for the Torah proceeds in the next verse to lay upon the person sought to be seduced the duty of bringing the tempter to justice; and according to the established rule (Mak. iii. 4) wherever a prohibition in the Torah is followed by the command to do an opposite act, the prohibition carries no punishment with it. For Accessories before the fact to other offenses than idolatry the written law pronounces no penalty; nor does it anywhere say in set terms: Do not counsel or procure forbidden acts to be done by others. Hence, the Scriptural punishment of death, or of forty stripes save one, can not be adjudged even against him who employs a murderer to take a man's life; for it is the foremost principle of the Talmudic criminal law that sentence of death or stripes must not be awarded for any offense not expressly denounced in the written law, but derived from it only by construction or by "searching." 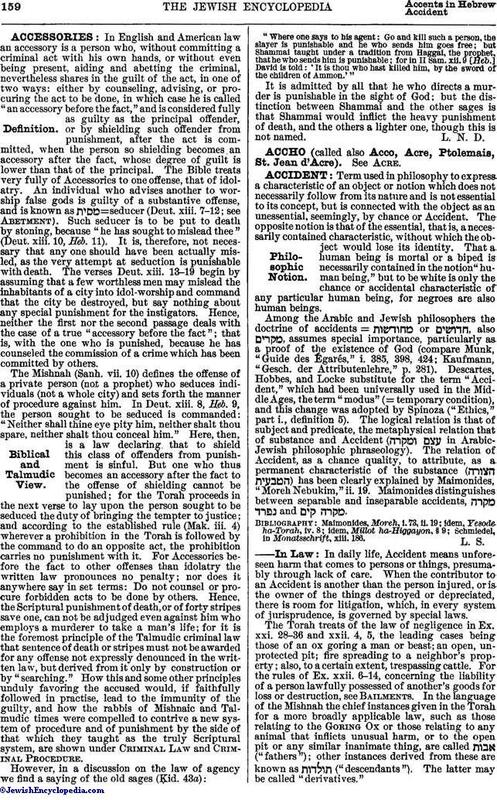 How this and some other principles unduly favoring the accused would, if faithfully followed in practise, lead to the immunity of the guilty, and how the rabbis of Mishnaic and Talmudic times were compelled to contrive a new system of procedure and of punishment by the side of that which they taught as the truly Scriptural system, are shown under Criminal Law and Criminal Procedure. "Where one says to his agent: Go and kill such a person, the slayer is punishable and he who sends him goes free; but Shammai taught under a tradition from Haggai, the prophet, that he who sends him is punishable; for in II Sam. xii. 9 [Heb.] David is told: 'It is thou who hast killed him, by the sword of the children of Ammon.'" It is admitted by all that he who directs a murder is punishable in the sight of God; but the distinction between Shammai and the other sages is that Shammai would inflict the heavy punishment of death, and the others a lighter one, though this is not named.